In a stand mixer, blend Nutella, butter, and powdered sugar until combined. 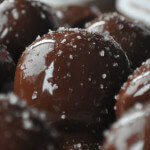 Once balls are formed, heat chocolate, and dip each ball. Once dipped, add sea salt if desired.